Based on Dreamer's Visualboy Advance skinning tutorial (with permission). Note: In this tutorial Photoshop software is used to create the image! Select or make an image that you want to use for the skin. Leave some space in the image so you have your screen where the game will be played. It is recommended that you keep this an integer of the actual native screen size which is 240x160. Change the images background colour so that it can be traced easier. Use a completely different colour from that of the image, and take note of the RGB value of the colour used! You will need it later on! Select the exact pixel that the screen is going to start, mark down the X and Y co-ordinates, you will need it for the INI file. Now select the entire screen region with the select tool to get the width and height, again, mark these down; you will need them for the INI file! Now you are finished with the bitmap! Save it as a Windows bitmap and exit the software. Copy or move the bitmap you have created to the Regioncreator software folder. Open up a command prompt and navigate to that folder. Then wait for the program to trace the bitmap and create the .RGN file. 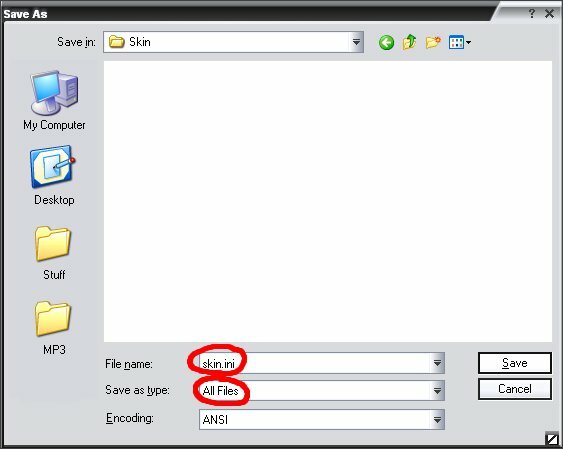 Now your region file and bitmap are complete, move them BOTH to wherever you want to keep your skin. You should so far have 2 files, your bitmap and your region file (.rgn file). Now you need to fill in the 3 parts. For image you need to simply type the filename of the bitmap you have made, for example gba.bmp. For region you need to type the filename of the .RGN file, for example gba.rgn. Now save the text as an INI file named as anything. When saving, under 'Save as Type' select "All Files" and end your filename with .ini. Thanks to Dreamer for the basic tutorial this was based on and images!